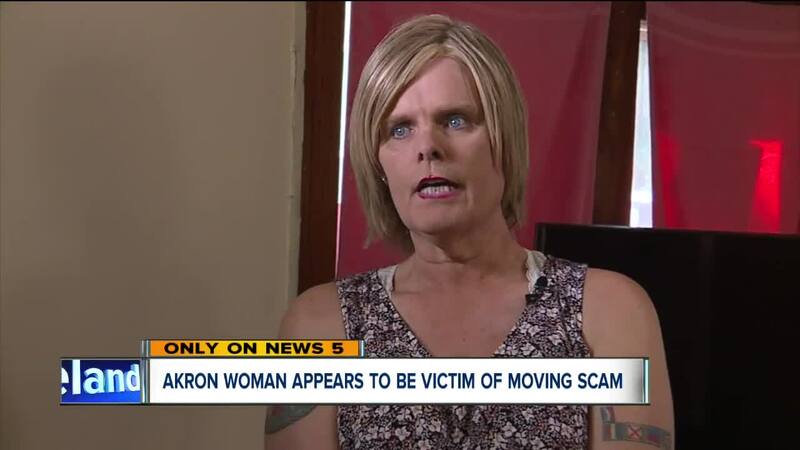 Alison Schaffer stood in the mostly-empty Akron house she recently rented, convinced she has been scammed out of most of her belongings. "I think I have been taken advantage of big time," Schaffer said. A month ago, Schaffer, a Navy veteran, paid a moving company called "AllState Moving Solutions" to move about $40,000 worth of her stuff from Kentucky to Akron. The haul included all of her living room furniture, a bedroom set and much more. "My passport was in there, along with critical medical records, and basically stuff that I can never recover if it's not replaced," Schaffer said. In July, Schaffer said she paid the moving company $450 by credit card and an additional $1,292 with a cashier's check and was told her delivery would be made by July 28. "They never delivered," she said. The Better Business Bureau of Northern Indiana said in recent weeks they have received six similar complaints about AllState Moving Solutions. Some who filed complaints also said they had paid for a move, but the company continued to ask for more money and held belongings hostage. Marjorie Stevens, the CEO of that BBB branch, said the agency has launched an investigation but hasn't been able to track down any information about the moving company which lists an address in Munster, Indiana. "I'm very concerned," Stevens said. "I'm just saying, are they extorting money? They would have an F rating. It would be very concerning to me as a consumer." Stevens said the company is not responding to the complaints. In the meantime, Schaffer had to shell out more money for a chair and a bed so she didn't have to continue to sleep on the floor. "I am so frustrated that I got kinks in my back and my sleep has been horrible," she said. Schaffer said a driver for the movers has indicated the Akron resident would have to pay more money to get all of her stuff. Most recently, she was told she would have to come up with another $2,000. Prior to that, she was told to pay another $892. Desperate to get her belongings back, Schaffer had a cashier's check delivered to her home but told the driver she would only pay it in person once her possessions arrived. However, the truck remains a no-show. "I left messages several times a day. I sent them an email. No reply. I went on their Facebook. No reply. Nothing," she said. The BBB says if you need a moving company, do your research, get three estimates and get agreements in writing. The agency said it's a red flag if movers demand cash or a large deposit before a move.